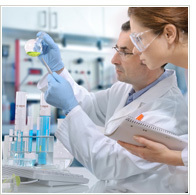 Studying chemistry is an excellent way to begin an exciting and fulfilling career. Chemistry is considered a principal science. It has applications in math, physics, biology, medical science, and environmental science. Graduates who hold bachelor&apos;s degrees in chemistry can fill various jobs in private industry, education, and government. If you intend to work for a chemical company or teach chemistry, you should study chemistry as an undergraduate. Additionally, people interested in careers in biotechnology and molecular biology, forensic science, and hazardous waste management greatly benefit by studying chemistry. Many individuals with bachelor&apos;s degrees in chemistry find entry-level jobs in laboratories or the process and quality control divisions at factories. After acquiring some experience, these professionals often get promoted to work in management, marketing, and sales. Many people with bachelor&apos;s degrees in chemistry earn graduate degrees to work as patent lawyers, senior-level managers, and other specialists. Select a concentration below to explore various chemistry majors and view colleges and universities offering majors and degree programs in general chemistry, chemical engineering, organic chemistry and more. San Luis Obispo, California, US. 10 Kent Ridge Crescent, Singapore. Las Cruces, New Mexico, US. Salt Lake City, Utah, US.